Animal Defenders International : Animals in entertainment : Wales must ban wild animal acts to stop circus suffering. Wales must ban wild animal acts to stop circus suffering. Update: A huge thank you to everyone who took part in the consultation. 968 responses were received, with ADI one of 70 comprehensive responses, and 892 specifically responding to the question about wild animals in circuses. Given the support there was for a licensing regime for Mobile Animal Exhibits in Wales, this will now be developed. Regarding wild animals in circuses, following the “strong support for a ban”, the Welsh Government has indicated that it will work with Defra and the Devolved Administrations to “consider cross-border issues”. Ms Griffiths announced the findings of the public consultation on the introduction of a licensing or registration scheme for Mobile Animal Exhibits (MAEs) in Wales would be published in January 2018, confirming that almost 1,000 responses had been received, with most specifically responding to the question on banning wild animals in circuses, indicating “the strong public feeling on this matter”. The Welsh Government commissioned Professor Stephen Harris at Bristol University to undertake a report on the welfare of wild animals in travelling circuses in 2015, and conducted a public consultation in October 2017 on mobile animal exhibits, which asked respondents if a ban on wild animals in circuses should be considered. The report by Professor Harris, published last year, concluded that “The available scientific evidence indicates that captive wild animals in circuses and other travelling animal shows do not achieve their optimal welfare requirements.” The report also stated that “Life for wild animals in travelling circuses…does not appear to constitute either a ‘good life’ or a ‘life worth living’” with the expert analysis supporting a ban on wild animal circuses, as well as mobile zoos, on animal welfare grounds. Responding to the public consultation ADI and supporters urged the Welsh Government to introduce a ban on the use of wild animals in travelling circuses at the earliest opportunity. Although animals in mobile animal exhibits suffer a number of similar welfare issues, there are distinct welfare issues associated with the use of animals in travelling circuses, and the constant travel and confinement they are subjected to. Given the constant travel and their temporary nature, circuses cannot provide animals with adequate facilities to keep them physically or psychologically healthy. Welfare is inevitably compromised. Animals in circuses can also be subjected to brutal training methods and violence – wherever ADI has conducted an undercover investigation in the UK and around the world it has documented acts of abuse. Animal circuses do nothing to teach people about the animals’ real needs and the way they live, and have no role to play in education or conservation. Despite there currently being no wild animal circuses in Wales, circuses with such acts do visit from England and three have visited Wales in recent years, Circus Mondao, Peter Jolly’s Circus and an Evening with Lions and Tigers. With no bar to wild animal circuses in place, the door is open to others joining them. ‘An Evening with Lions and Tigers’ toured Wales in 2015 and featured two lions and three tigers forced to perform tricks under the guise of education. At the time, Pembrokeshire-born actor and musician Rhys Ifans, known for his role in Notting Hill, backed ADI’s call for a ban stating that “Like bear baiting, witch burning and the “Welsh not", this cruel practice belongs in the past.” The show was prevented from performing in England over welfare failings, and sparked a public outcry, meeting with political opposition, protests and petitions. 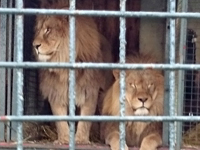 A 2016 investigation by ADI recorded at the big cats’ accommodation in Staffordshire, where they have spent the past two years, documented the animals confined for the majority of the time to their cages on the back of a truck, with restricted daily access to an outdoor exercise area. On one of the days observed, the lions were not let out at all. ADI also exposed last year the miserable lives of the animals at Peter Jolly’s Circus when they are not on the road documenting appalling overcrowding, fighting between animals, a worker spitting in the face of and tormenting a camel, ponies tangled in short tethers, animals crammed in a run-down building for 14 hours a day, some animals shut in the dilapidated building for days on end, on one occasion animals tethered for up to 40 hours, government regulations ignored. In Wales, keep up the pressure to stop circus suffering! Contact your AM today. In Scotland, the bill to ban wild animal acts is progressing through parliament - please urge your MSP to vote in favour of the bill, without further amends. In Ireland, urge your MLA or TD to support a ban. In England, legislation has been drafted and ready to go since 2013 but continues to stall – ask your MP to urge the government to introduce the law without further delay. Support our campaign to stop circus suffering around the world.